They were films that, at least to me at the time, were imbricated in trends problematizing the nation and media. I decided not to rank them, but instead group them under one of five rubrics which exemplified this questioning of identity and cinema: "The Appearance of Others," "The Encounter with Death," "Wandering Identities," "Alternative Identity," and "New Japanese Entertainment Film.” As a matter of policy, I did not select two or more films by the same director. The eventual list included quite a number of films that are now “canonical,” from Tetsuo to Sonatine, but I’m proud to say I included some, like Cure, even before they were released in Japan. I was also proud to include some experimental works, such as Sekine Hiroyuki’s Ruins of Roppongi, that are masterpieces, but are virtually never shown (since Sekine shot that work on 8mm). I also included some films, such as Swallowtail Butterfly, that I do not like (you can read my critique of it here), but which I nonetheless thought significant. Some, like Ame no wadachi, were never really shown again, but I feel including such films is another way of questioning canon formation. And of course, there are a few I would probably not pick if asked to choose today. This list is thus also a historical relic. 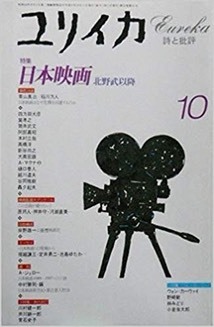 Aaron Gerow, "Nihon eiga 1989-1997 besuto 30: 'Nihon' to 'eiga' o saiteigi suru tame no hitokasetsu" (The Best 30 Japanese Films 1989-1997: A Proposal for Redefining “Japan” and “Film”). Yuriika (Eureka) 29.13 (October 1997): 292-298.